Kansas City Ballet’s world premiere of “The Wizard of Oz” shows us just what can be accomplished with $1 million: A visually spectacular, elegantly choreographed, expertly designed, surprisingly poignant retelling of the L. Frank Baum classic book — all set to an evocative score by composer Matthew Pierce. In other words, this joint production with the Colorado Ballet and the Royal Winnipeg Ballet is a seductive joyride of visual and auditory delights. Choreographer Septime Webre, who in his program bio relates his childhood obsession with the Oz books, brings an inventive playfulness to the production and makes the familiar story seem fresh again. That’s not easy because virtually everyone knows the story. But that can work to the creative team’s advantage because nothing needs to be “explained,” allowing them to employ a kind of visual shorthand. Baum’s story through the decades has acquired the status of an American fable addressing fundamental themes — the longing for home, finding the courage to persevere, acquiring the wisdom to distinguish between reality and illusion, America’s transition from agrarian to urban society, the importance of community as well as self-reliance. Every audience is intimately familiar with the narrative, thanks mainly to the 1939 film, which shaped multiple generations’ perceptions of the Land of Oz. The ballet certainly takes cues from the movie: Dorothy’s life in Kansas, dominated by a gray-scale palette, brings to mind black-and-white prints by Missouri painter Thomas Hart Benton. When she lands in Oz, the landscape explodes into color. The Tin Man, the Cowardly Lion and the Scarecrow are executed with seductive charm by, respectively, Lamin Pereira dos Santos, Liang Fu and James Kirby Rogers. They lend the roles distinctive personalities with a huge assist from costume designer Liz Vandal. She concocts a kind of steampunk metallic outfit for the Tin Man and gives the Scarecrow an orange mohawk. The Lion, lithe and muscular, has a face framed by tufts of fur and, as in the film, has a very long tail Fu humorously incorporates into his performance. Indeed, Vandal and Webre exhibit repeated audacious flourishes throughout the production. 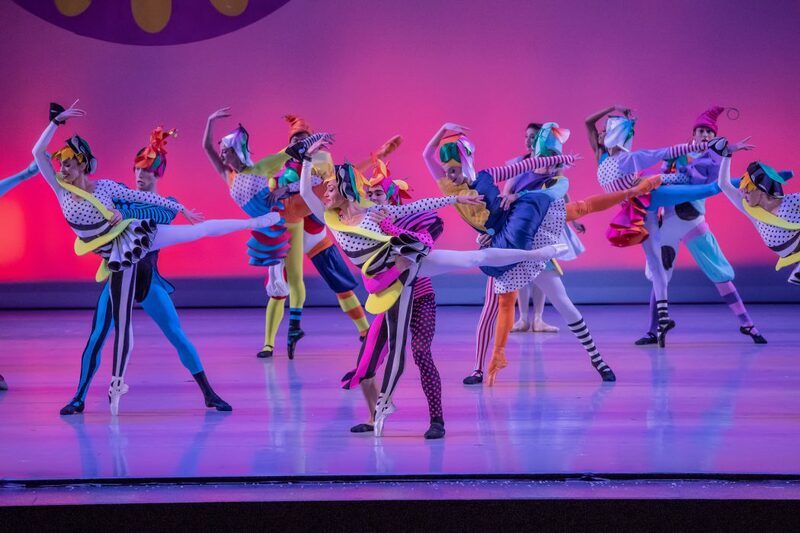 The Yellow Brick Road is depicted by scenic elements as well as the “Yellow Brick Roadies” — eight dancers representing “bricks” who form various configurations that change repeatedly. The appearance of the terrifying winged monkeys is accomplished by three dancers suspended from above while behind them costumed company members operate big flexible puppets, suggesting an army of airborne monkeys stretching to infinity. It’s the most spectacular illusion in a production full of spectacular illusions. Trad A Burns’ lighting, Michael Raiford’s scenic design and Aaron Ryhne’s projections help make this one of the most visually impressive shows I’ve ever seen, and that includes Broadway and Cirque du Soleil. Speaking of puppetry, an audience favorite was the mechanical dog Toto, operated by Jeremy Hanson in full view of the audience. Thanks to Hanson’s artistry and Nicholas Mahon’s ingenious puppetry design, Toto becomes a living, breathing presence on stage. The show hits all the narrative highlights, sometimes accomplished through a combination of lighting, puppetry and projections. There’s an impressive Kansas tornado. Red poppies fill the stage in a visually spectacular ballet. A dance sequence by the glittering green residents of the Emerald City makes you want to climb up onstage and explore the place. From the opening moments, Pierce’s lush score hooked me. He suffuses the early Kansas sequence with Americana themes reminiscent of Aaron Copland, but as the show progresses the music becomes more inventive and unpredictable as the composer incorporates elements of jazz and pop music. He employs sliding trombones for certain comic moments, the occasional saxophone line, soaring strings and a percussive scheme that ranges from delicate triangles to light snares and thundering timpani. It’s an infectious composition, performed flawlessly by the Kansas City Symphony under the baton of ballet music director Ramona Pansegrau. Altogether, this production imprinted indelible images on this viewer’s memory. It also achieves authentic emotional resonance. Dorothy’s journey, so expressively performed by DeVenuta, reflects a near-universal experience. It is simply this: Your present inevitably becomes your past, a past that can only be understood by plunging into the future. 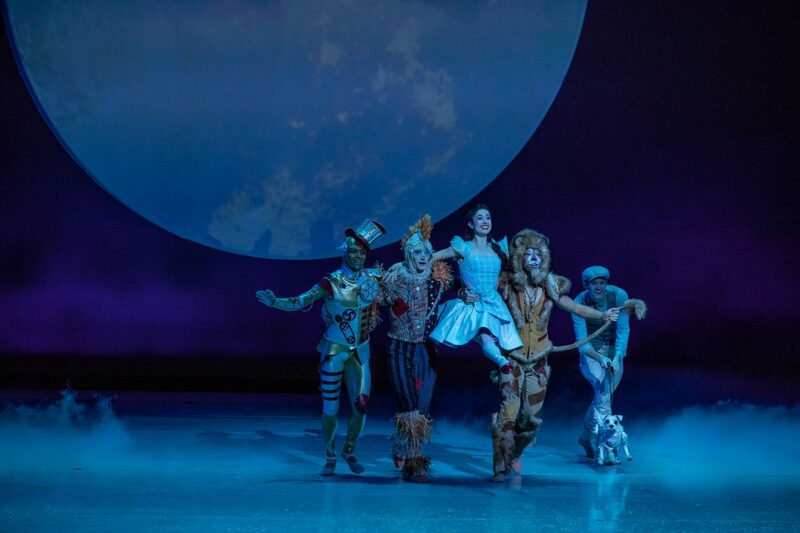 “The Wizard of Oz” continues through Oct. 21 at the Kauffman Center for the Performing Arts. Call 816-931-8993 or visit www.kcballet.org.